You always remember your first time right? Some years ago now, we started getting a touch of the red dirt wanderlust. 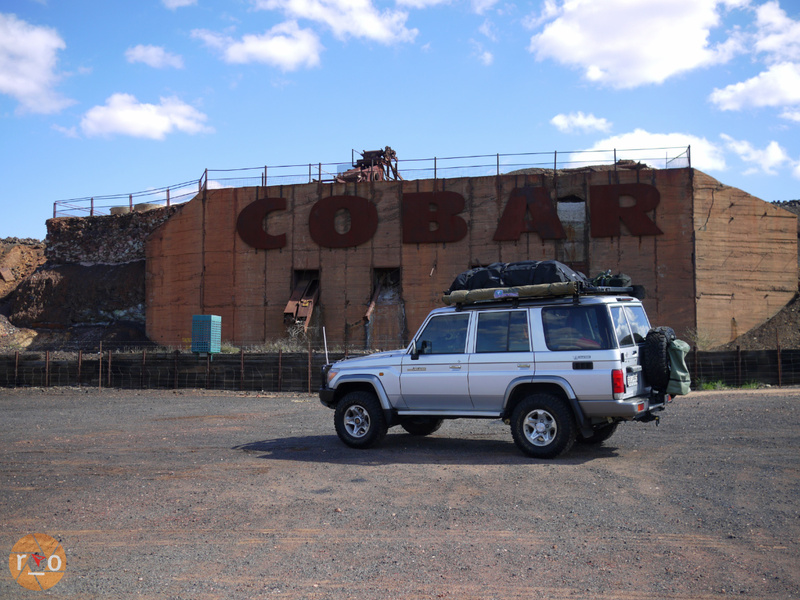 We had rocked and rolled up and down the local tracks and bush bashed around NSW, but we wanted to go…. out there. Initially planning a convoy with fellow explorers we began plotting a jaunt with a particular State junction in mind. Cameron Corner. 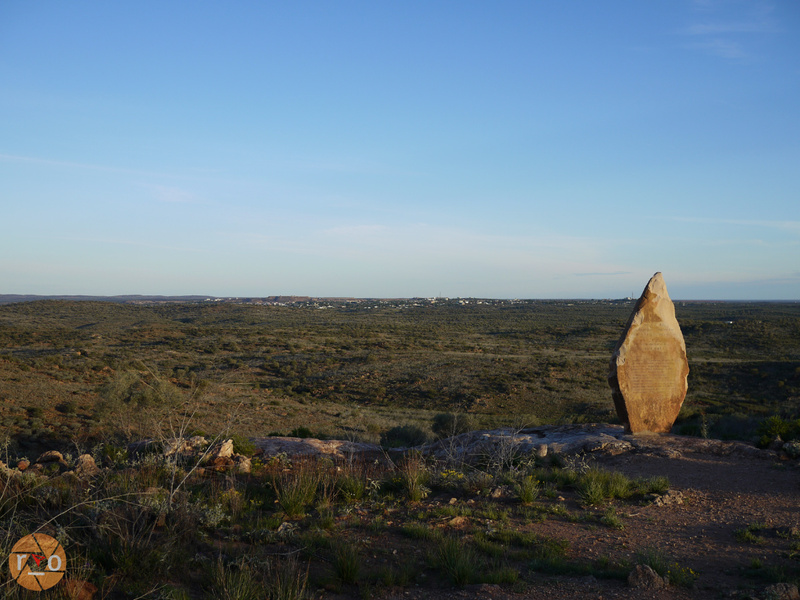 I had finished reading Frank Clune’s recollection of Burke and Wills wilfully woeful journey so I was keen to see the famous Dig Tree as well. Like Burke and Wills, we were keen to learn how far we could make it with our silver camel. So, after some preparation to the LandCruiser (introduced here) and a subtle change of plans from convoy to solo, David and I set off. It was early morning, MSA rooftop bag fresh and strapped with our mattress, chairs, washing bucket and the Oztent of course. Border Collie smothered in kisses and regretfully left at home. Breakfast at an organic diner in Lithgow, the temperature was chilly but we were too excited to care. We were more interested in how many kilometers we could cover in a day headed west for the first time. Once we past Bathurst, we were as far west as we had ever been together. We stopped in almost every town just stretching our legs and appreciating the ‘firsts’ each one afforded. I feel a lightened sensation whenever we summit the Blue Mountains, leaving behind the Sydney basin. Time slows down to a normal pace, less tachycardic definitively outside the captital. I had plotted a number of freecamp options, as I was unsure of my driving stamina. We ended up at Snake Creek Rest area, Sandy Plains. Amusingly, near Nevertire. We had the place to ourselves, grassy, green and shadey. The northbound highway hosting cotton haulers but they failed to keep us awake for too long after a dinner of sausages, onion and potatoes sauteed together in the cast iron skillet. Our first packup the following morning was relaxed and drama free in the cool cloudy temperatures. Pushing ever west, we had a roadside lunch of rice cakes with cheese and tomato. Enjoying the real solitude. We were starting to see actual red dirt now and this would fuel our energy for the drive. Or would it? Driving the straight road west actually started to fatigue us both, despite how exillerating it had began, we were feeling properly outback now. Red dirt anchoring mallee and taller eucalypts. Wild goats casually eating the roadside growth unperturbed by the sporadic traffic only metres away. Their smaller offspring offered clumsy dashes but evidently they would soon learn to ignore vehicles, for better or worse. The vista before us however, actually felt difficult to focus on. Without variation in turning or other traffic to negotiate my eyes felt hypnotised for lack of a better description. We stopped regularly, now understanding our long distance stamina would be something we would develop rather than materialise on sheer will alone. Avid hours of driving, for the sake of driving, was something I may have mistook for long distance training. 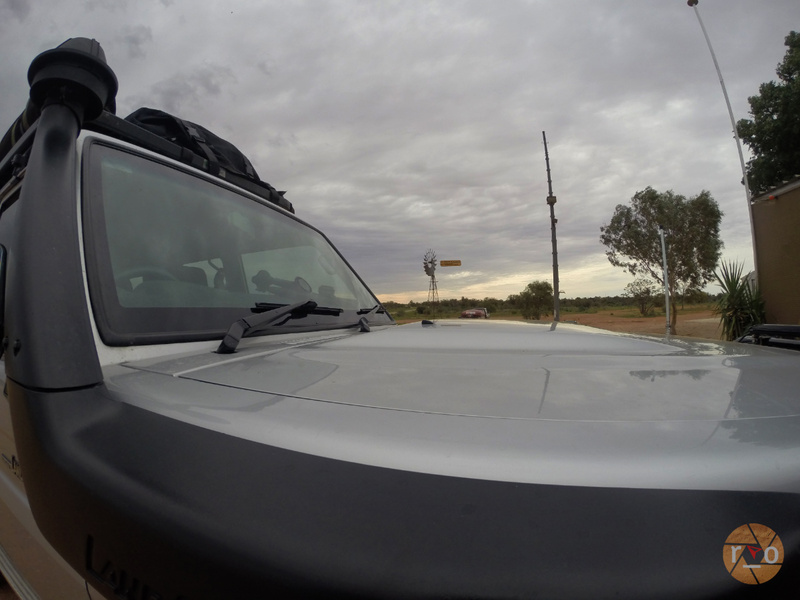 As the sun levelled annoyingly in our faces we pulled into Wilcannia, needing fuel. There were some kids hanging around and despite being told we should avoid stopping, we did. I was transfixed to see small hawks on the powerlines instead of magpies seen in the urban streets of home. We needed fuel and a toilet stop, both of which were truncated to express splash and dash – our young hosts proving less than welcoming. We paid for our trickle of fuel and departed. Blaming the witching hour on their foul mouthed claim to the restroom. 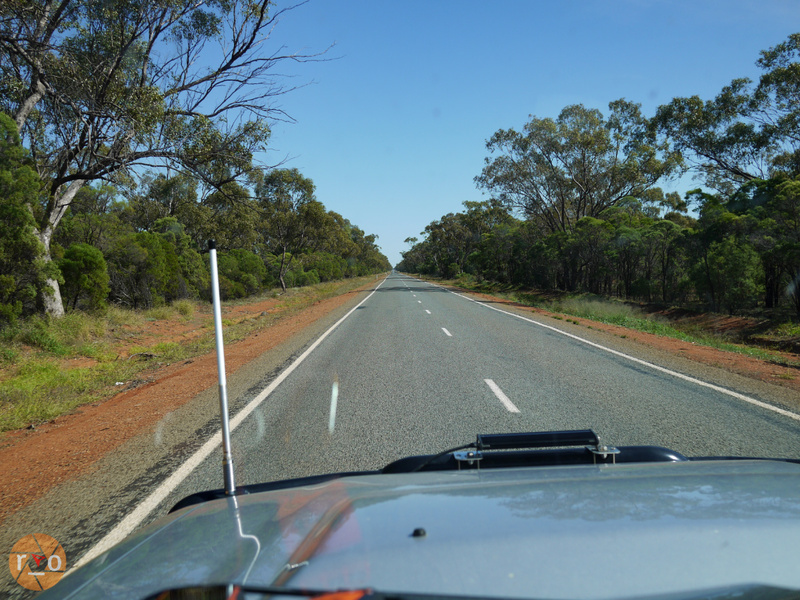 This stretch would trump the likely unfounded stress of teenage angst in Wilcannia. 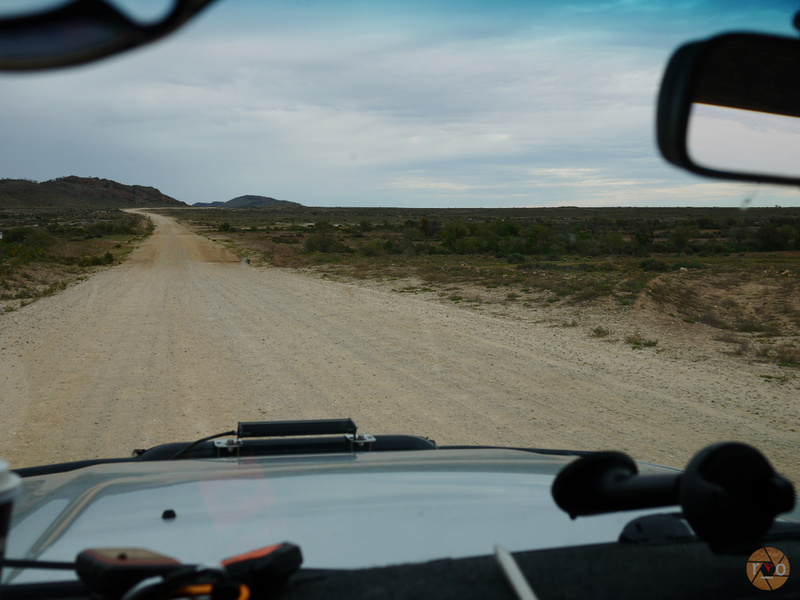 At some point of the undulating country towards Broken Hill, the fuel light came on. Breathing shallow, spotlights on now, due to the dusk – I was anxious to make it to a camp. 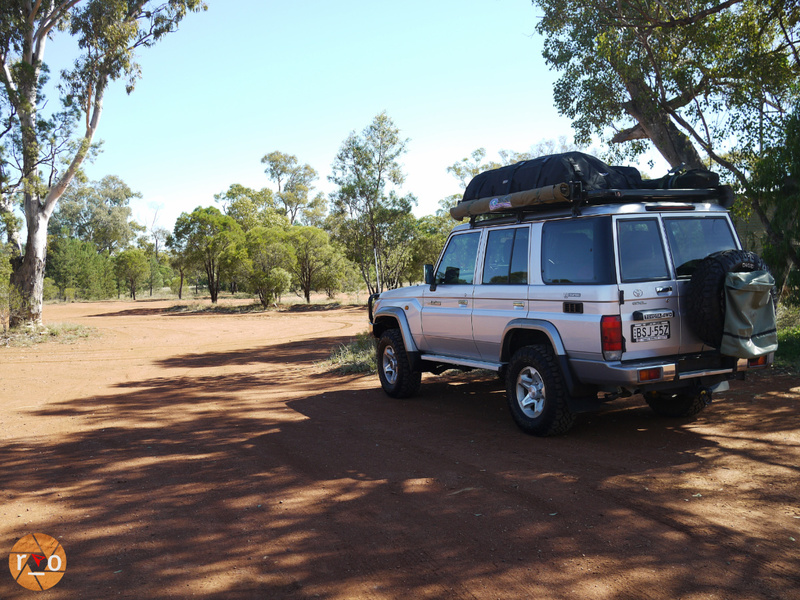 No such roadside camp appeared to suit us in the tent given the gravel so we pushed on for Broken Hill. Despite my growing paranoia, we made it and fuelled up before trying the Tourist Park for a plot of grass. Over tired now and not feeling up to further exploration in the now dark hour of dinnertime. Paid (around $25) and pitched, we had one neighbour in the tent area. Cooking up a basic fair of lamb chops and vegetables we were treated to a vintage car and caravan cruise who had unhitched at the same caravan park. Despite this adding to the populous and it’s potential noise factor – the reward was a free tour of their setups. Most had authentic camping and caravanning settings under their retro awnings. Melamine cups and vinyl folding tables. Coupled with the glint from their chrome bumper tow vehicles, we appreciated their time travelling hobby. Their vintage rabble didn’t keep us awake either, exhausted by both the drive and the adrenaline dump. Tinitus in my ears from the highway roar. We were on South Australia time now, holiday time. We had a new metropolis to explore tomorrow so we were showered and slumbering early. The weather was turning, we could feel it in the air but we enjoyed a couple of days of cool clear days, albeit a weak sun. We drove out to Mundi Mundi and explored Silverton as is declared in the mandatory guide. 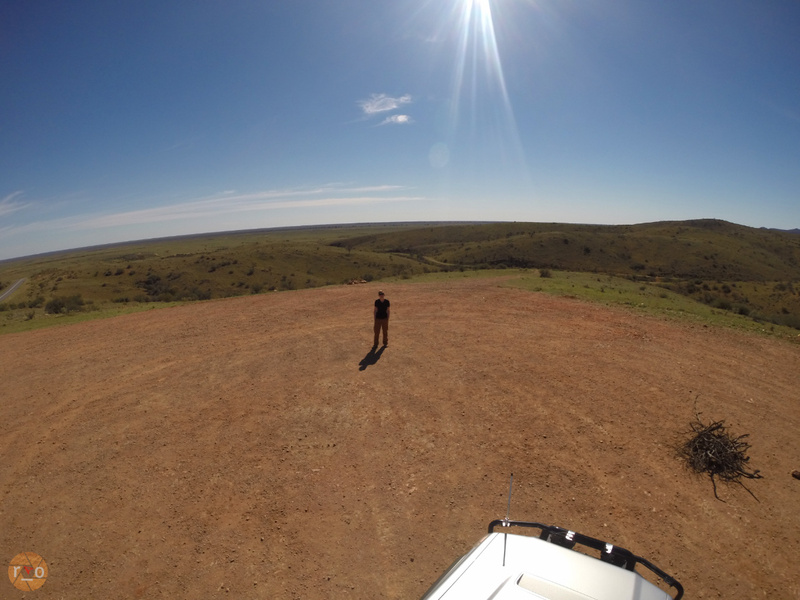 We also visited the Royal Flying Doctors. 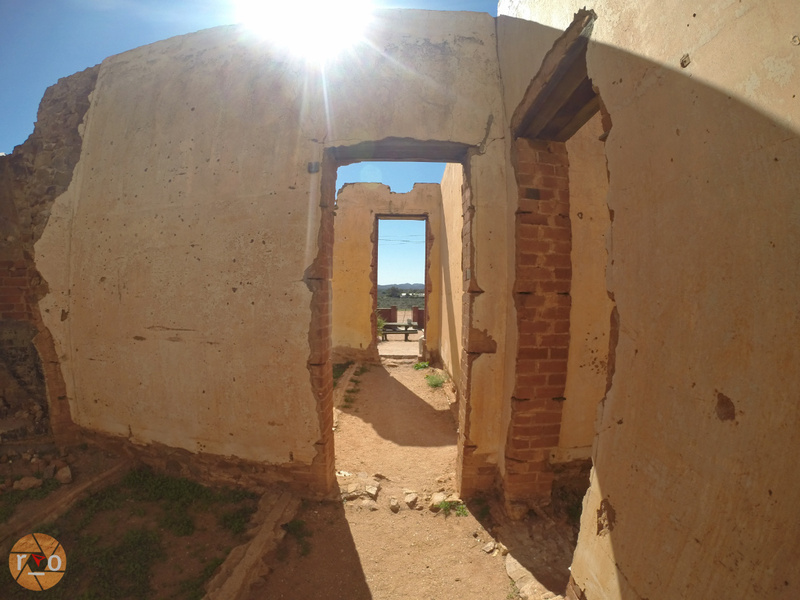 Mining, the grandfather of Broken Hill is celebrated everywhere and it can’t be missed, the hill above the town establishing its permanent responsibility for the settlement. We bought some meat from the butcher and made plans to leave in the morning, having satisfied our urban exploration. That turn in the weather now much more apparent. It became blowy that evening and the sky took on a pinkish hue. The same wind had us up and packed early, keen to be moving. It wasn’t long on the Silver City Highway before the black clouds in the rear view mirror relinquished their contents on the town. Ahead, the sky was grey but the horizon, gratefully open. Having escaped the township we were back in mode. Eyes pealed and additionally sensitive to the features. We were lucky enough to come across emus, lakeside and not interested in us or the camera. Stopping at every brown sign we could enjoying the road seemingly to ourselves. The unsealed Highway was not challenging but the occasional unsigned dip or cattle grid kept us alert. 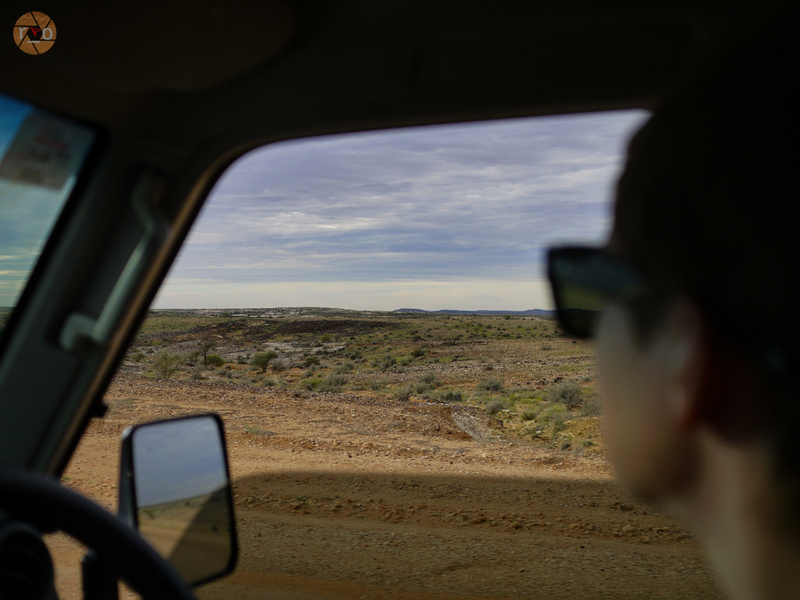 Quicker than we thought – we rolled into Packsaddle. The clouds really grumbling now. 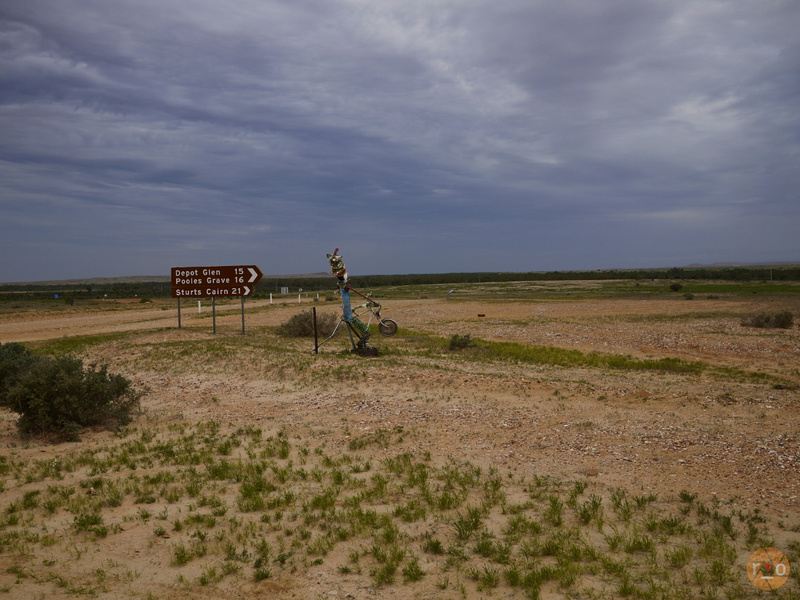 The staff told us they had closed the Highway behind us as it looked to have settled in and was quenching Broken Hill in a deluge that may also reward Packsaddle if they kept their fingers crossed. We kicked back and had a massive lunch of steak, salad and chips. We were fueled now to explore the ruins of Malparinka. On arrival, the door slammed back at me preventing me getting out. The weather had caught up with us and it was bitterly cold. The occasional raindrop carried from afar. Throwing on a jumper we toured the buildings, their restoration evident and painstakingly detailed. The provided camping area wasn’t particularly tent friendly in the wind so we pushed on. Keeping the foul weather in the rear view we enjoyed the lack of sun glare on the horizon and kept our eyes out for wildlife. Small patches of bitumen, infrequent, interrupted our dust trail. 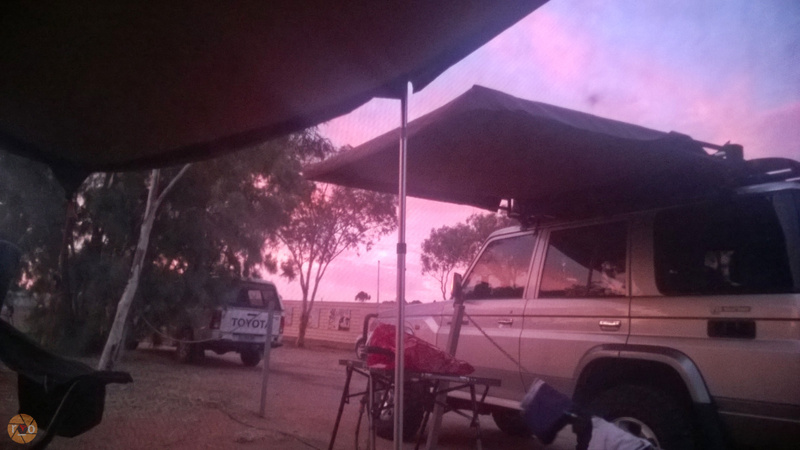 Just like that we were bathed in sunlight and struck by the sudden appearance of Tibooburra. Having researched our options I chose to stay at the Aboriginal reserve rather than push on outside to the National Park. 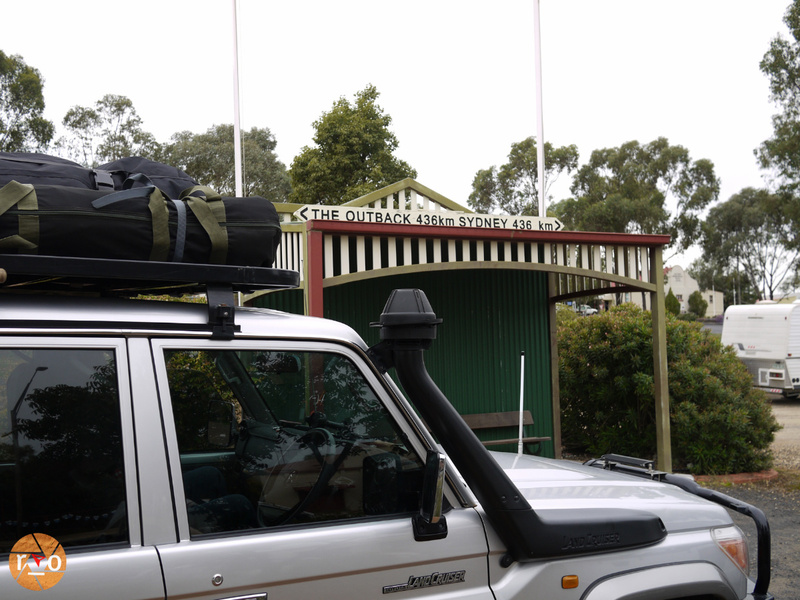 It was a pretty township and I saw no need to keep going, despite how quickly we had covered the Silver City Highway. Paid up at the Corner Store ($15) and pitched with a solitary neighbour over the other side. 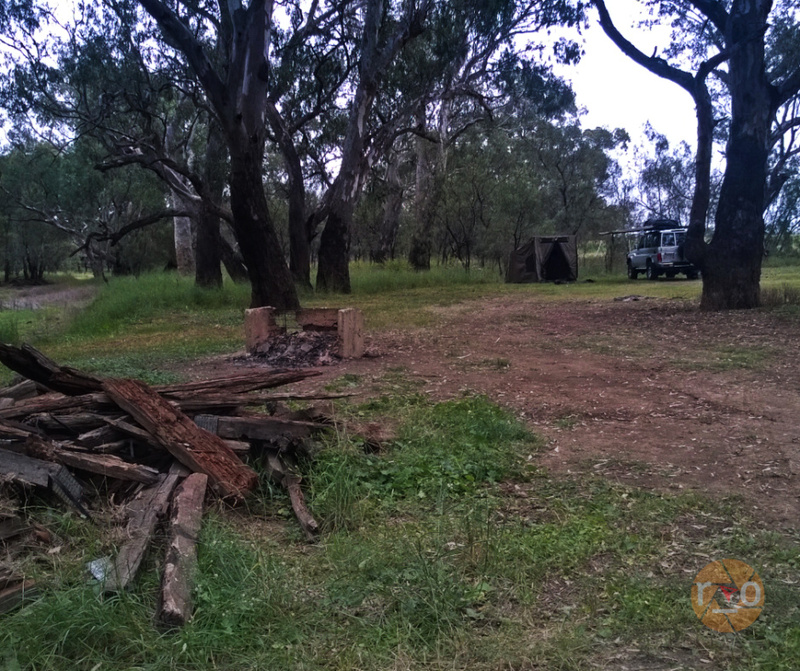 The reserve was spacious, grass free but dotted with dwarfed gum trees, vintage play equipment and a dry creek bed meandered around us. 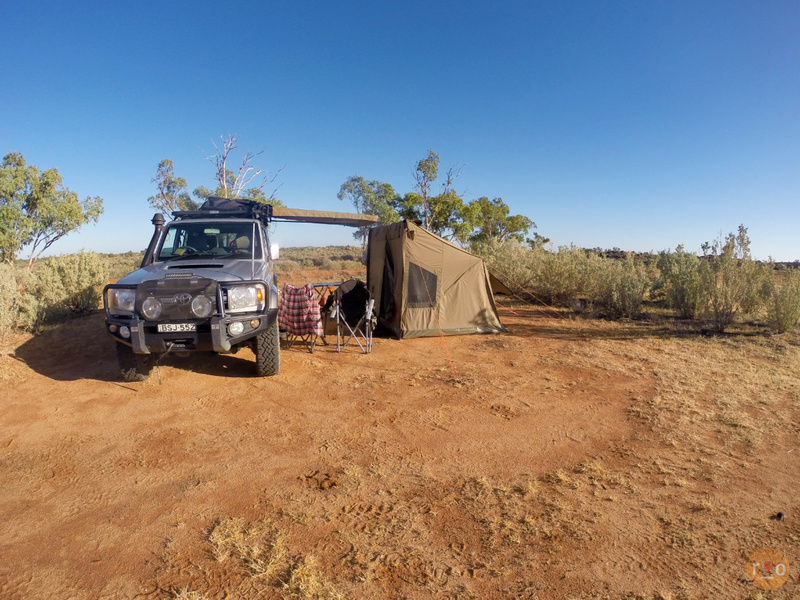 This was our first time unfolding the tent on the red dirt and combined with the chill in the outback air – we were excited and happy to be finally…. out there. Here. Parked close to the tent, the Hannibal awning providing us with both light and shelter from the occasional drop of rain we cooked dinner, rugged up in my oilskin. A gas warmed shower awaited us in the shed across the way and it was divine. The chill of the growing wind creeping under the Colorbond walls combined with the hot water makes for a luxuriously ‘outside’ shower. 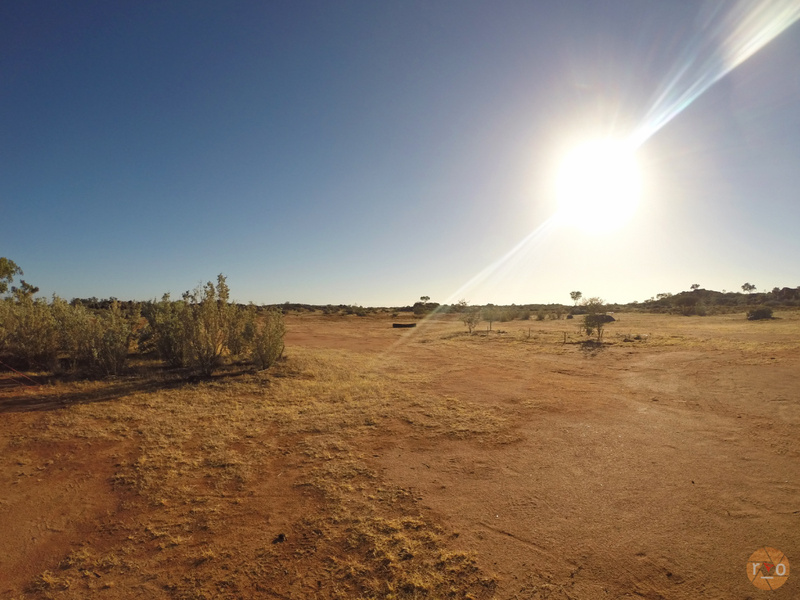 We stayed up later than previous nights, too excited at the red dirt under us, the bird sized moths harassing the camplight and the proper quiet that only the nocturnal outback can supply. There was no real rain for us, the stiff breeze cleared the sky and the autumn chill descended on us through the night. The sun woke me early and I happily shuffled about in oilskin and beanie, enjoying the morning chatter from the finches in the trees. This would be one of my favourite paid campsites so far, peaceful in its natural, quiet beauty but with the benefit of hot showers and proximity to the supplies and sustenance of town. Dressed we departed for the Corner Store, a big breakfast would go down better than the WeetBix in our supplies. Plus it would give us an opportunity to talk to the locals and get some guidance on the roads around town and the route to Cameron Corner. After breakfast we were introduced to the National Parks ranger who recommended some self drive tours we could do. A first for us, we fervently listened to her advice and took her information sheets and our excitement – out of town. It was time for some self guided exploring.